Responsibility is literally what it says – our ability to respond. It is a choice we make – whether to be attentive to our children’s needs, whether to be mindful of the plight of those less fortunate, whether to be considerate of the impact we have on the earth and others. To be responsible is to be proactive in the world, to be sensitive to the interconnections, and to be willing to do something constructive, as a way of giving back. If we expect the right to fair treatment, we have a responsibility to respect the rule of law and honour the principle of reciprocity. If we believe in the right to have our basic needs met, we have the responsibility to respond when poverty denies those rights to others. Taking responsibility, at home or in the workplace, is an expression of confidence in our own abilities, a chance to test our own limits, to challenge ourselves and to see how far we can go. Responsibility is the gateway to achievement. And achievement is the path to growth. Being responsible for something means that we are entrusted with realising its potential, turning its promise into reality. We are the magicians of manifestation, ready to prove to ourselves and to others what can happen when we put our minds to it, if we focus our energies and concentrate our efforts. Being responsible for someone – another person – is an even greater privilege, for it means that we are embracing our role as caregivers, helping others to develop and flourish. This is an awesome responsibility, in the truest sense, one which should be embraced with gratitude, not reluctantly accepted with trepidation. Responsibility asks no more of us than that we try our best, that we act in the highest and truest way we know. Responsibility is not a guarantee of success, but a commitment to trying. 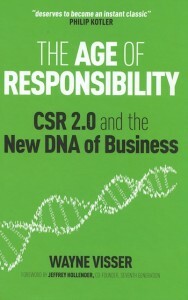 Visser, W. (2011) The Call to Responsibility: Our Ability to Respond, In W. Visser, The Age of Responsibility: CSR 2.0 and the New DNA of Business, London: Wiley. Corporate social responsibility (CSR) has been debated and practiced in one form or another for more than 4,000 years. For example, the ancient Vedic and Sutra texts of Hinduism and the Jatakas of Buddhism include ethical admonitions on usury (the charging of excessive interest) and Islam has long advocated Zakat, or a wealth taxi. The modern concept of CSR can be more clearly traced to the mid-to-late 1800s, with industrialists like John H. Patterson of National Cash Register seeding the industrial welfare movement and philanthropists like John D. Rockerfeller setting a charitable precedent that we see echoed more than a hundred years later with the likes of Bill Gatesii. 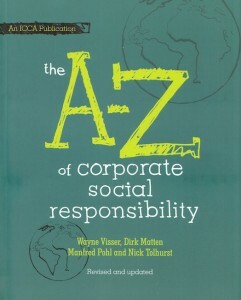 Despite these early variations, CSR only entered the popular lexicon in the 1950s with R. Bowen’s landmark book, Social Responsibilities of the Businessmaniii. The concept was challenged and strengthened in the 1960s with the birth of the environmental movement, following Rachel Carson’s critique of the chemicals industry in Silent Springiv, and the consumer movement off the back of Ralph Nader’s social activism, most famously over General Motors’s safety recordv. The 1970s saw the first widely accepted definition of CSR emerge – Archie Carroll’s 4-part concept of economic, legal, ethical and philanthropic responsibilities, later depicted as a CSR pyramidvi – as well as the first CSR code, the Sullivan Principles. The 1980s brought the application of quality management to occupational health and safety and the introduction of CSR codes like Responsible Care. In the 1990s, CSR was institutionalised with standards like ISO 14001 and SA 8000, guidelines like GRI and corporate governance codes like Cadbury and King. The 21st century has been mostly more of the same, spawning a plethora of CSR guidelines, codes and standards (there are more than 100 listed in The A to Z of Corporate Social Responsibility), with industry sector and climate change variations on the theme. Why is all this potted history of CSR important in a discussion about the future? Well, first, it is to realise that CSR is a dynamic movement that has been evolving over decades, if not centuries. But second, and perhaps more importantly, it is to acknowledge that, despite this seemingly impressive steady march of progress, CSR has failed. Furthermore, we are witnessing the decline of CSR, which will continue until its natural death, unless it is reborn and rejuvenated. That is a bold claim, so it deserves substantiation. CSR has undoubtedly had many positive impacts, for communities and the environment. Yet, its success or failure should be judged in the context of the total impacts of business on society and the planet. Viewed this way, on virtually every measure of social, ecological and ethical performance we have available, the negative impacts of business have been an unmitigated disaster, which CSR has completely failed to avert or even substantially moderate. Visser, W. (2010) CSR 2.0: The Evolution and Revolution of Corporate Social Responsibility, In M. Pohl & N. Tolhurst (eds. 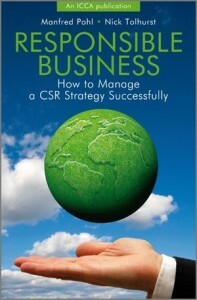 ), Responsible Business: How to Manage a CSR Strategy Successfully. Wiley. We have been seduced by ‘corporate libertarianism’, which demands that all political, economic, and civic barriers to the free reign of corporate interests be removed. The result of this unhealthy power in corporate hands is ecological destruction, the loss of civil freedoms, the erosion of democracy and community disintegration. Although the current corporate globalization represents a failure of governments, it is more fundamentally a failure of the global capitalist economic system. We are on the cusp of an Ecological Revolution, which puts people ahead of corporations, local communities ahead of global trade and nature ahead of money. When Corporations Rule the World suggests that the promises of the global economy are based on a number of myths: that growth in GNP is a valid measure of human well-being and progress; that free unregulated markets efficiently allocate a society’s resources; that growth in trade benefits ordinary people; that economic globalization is inevitable; that global corporations are benevolent institutions that if freed from governmental interference will provide a clean environment for all and good jobs for the poor; and that absentee investors create local prosperity. Korten believes that these myths are finally being unmasked and challenged by an Ecological Revolution that calls us “to reclaim our political power and rediscover our spirituality to create societies that nurture our ability and desire to embrace the joyful experience of living to its fullest.” He argues that instead of concentrating on increasing economic growth and GDP, we should concentrate on ending poverty, improving our quality of life, and achieving a sustainable balance with the Earth. In order to achieve this goal of “sustainable well-being for all people”, Korten believes that we need a multilevel system of nested economies with the household as the basic economic unit, up through successive geographical aggregations to localities, districts, nations, and regions. Each level would seek to function as an integrated, self-reliant, self-managing political, economic and ecological community. Visser, W. (2009) When Corporations Rule the World, In W. Visser & Cambridge Programme for Sustainability Leadership, The Top 50 Sustainability Books, Sheffield: Greenleaf. Scientists have long been aware of the earth’s extreme temperature variations, with the last major ice age ending about 10,000 years ago. However, in 1824 Jean-Baptiste Fourier discovered a global warming (or greenhouse) effect, and in 1861, the Irish physicist John Tyndall carried out key research on carbon dioxide (CO2) and heat absorption. In 1896, Swedish and American scientists independently concluded that CO2 was the likely cause of global warming. By 1957, US oceanographer Roger Revelle was warning that humanity is conducting a “large-scale geophysical experiment”, while colleague David Keeling set up the first continuous monitoring of CO2 in the atmosphere, confirming year-on-year-rises. Despite these early signs, it took until 1979 for the first World Climate Conference, organised by the World Meteorological Organisation (WMO), to state that “continued expansion of man’s activities on earth may cause significant extended regional and even global changes of climate”. 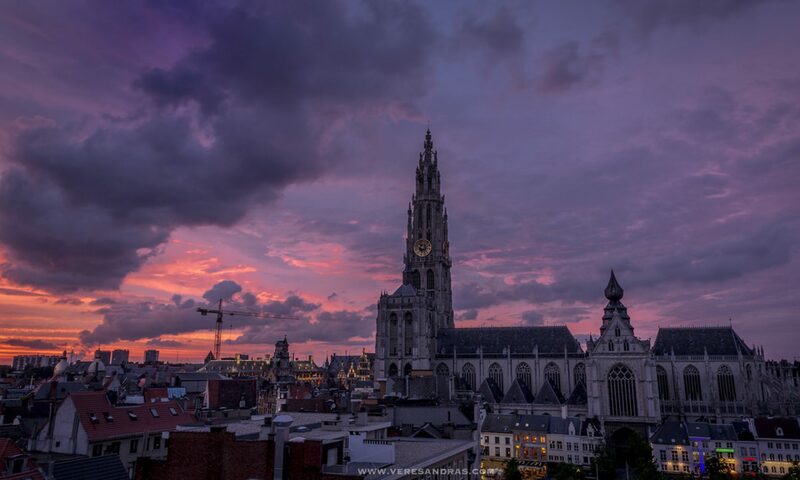 This led WMO and the United Nations Environment Programme (UNEP) to establish a scientific advisory body – the Intergovernmental Panel on Climate Change (IPCC). The IPCC issued its First Assessment Report in 1990, finding that the planet had warmed by 0.5°C in the past century and would rise further by 0.3°C per decade in the 21st century, accompanied by global mean sea level rises of 6 cm per decade. Convinced that the world needed a global policy response, the UN established the Framework Convention on Climate Change (UNFCCC), which 154 nations (including the US) signed at the Rio “Earth Summit” in 1992. In 1995, the IPCC Second Assessment Report confirmed that concentrations of greenhouse gas reductions (GHGs) were continuing to increase, and that the socio-economic impacts of climate change were significant, while the UNFCCC began negotiations on an international agreement to limit the emission of GHGs. The result was the Kyoto Protocol, adopted in 1997, which: 1) set mandatory targets for emission reductions for the world’s 38 leading economies, and 2) proposed three flexible market mechanisms for achieving these reductions through carbon trading. The targets collectively amounted to a 5.2% global reduction in GHGs from these countries against 1990 levels by 2012. 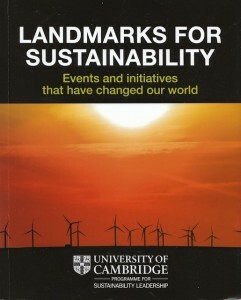 Visser, W. (2009) Climate Change, In W. Visser & Cambridge Programme for Sustainability Leadership, Landmarks for Sustainability: Events and Initiatives That Have Changed the World, Sheffield: Greenleaf. To conclude with a summary of the possible management implications of the typology of meaning for sustainability managers. For the purposes of my research, “typology of meaning” refers to the classification of typical sources of meaning derived by sustainability managers in their work into four types, each associated with distinctive roles within the organisation. The typology grew out of a realisation that four of the six sources of meaning in the work of sustainability managers were strongly related to organisational roles. The typology was included in the Sustainability Managers Research Model (Figure 4.1) that was presented to participants in the Phase 3 follow up interviews and received positive feedback. This section will introduce the four types that I identified, as well as the dynamics of the model. We can begin by identifying the four types: Expert, Facilitator, Catalyst and Activist. Each type represents a constellation of meaning. It is expected that any individual sustainability manager will embody elements of all of these types, but that the relative influence of each category will differ per individual. Hence, the dominant type can be thought of as a centre of gravity for meaning in the sustainability managers’ work, i.e. the mode of operating in which they feel most comfortable, fulfilled or satisfied. We can visually represent the idea that people derive meaning from a variety of sources by showing the types as boxes in four quadrants. The relative size of the shaded boxes simply indicates how much meaning the individual derives from each type. Hence, in the case depicted, the individual is perfectly balanced, showing equal preference for each of the types. An Expert derives relatively more meaning from the constellation of characteristics associated with this type. There is considerable overlap between the Expert type and specialist input as a source of meaning in work (Chapter 6). Therefore, rather than repeat the illustrative quotations from the interviews in full, Table 8.1 presents typical statements and phrases indicative of Expert type sustainability managers. These quotes illustrate some of the themes that characterise the way Experts find their meaning, namely by engaging with projects or systems, giving expert input, focusing on technical excellence, seeking uniqueness through specialisation, and pride in problem solving abilities. 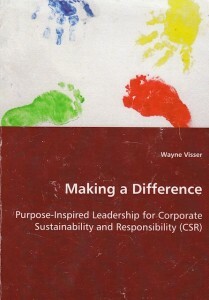 Visser, W. (2008) A Typology of Meaning, In Making a Difference: Purpose-Inspired Leadership for Corporate Sustainability and Responsibility, Saarbrücken: VDM, 218-237. The challenge for corporate social responsibility (CSR) in developing countries is framed by a vision that was distilled in 2000 into the Millennium Development Goals—‘a world with less poverty, hunger and disease, greater survival prospects for mothers and their infants, better educated children, equal opportunities for women, and a healthier environment’ (UN, 2006: 3). Unfortunately, these global aspirations remain far from being met in many developing countries today. The question addressed by this chapter, therefore, is: What is the role of business in tackling the critical issues of human development and environmental sustainability in developing countries? 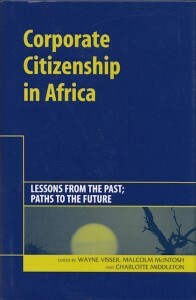 To begin with, it is worth clarifying my use of the terms developing countries and CSR. There is an extensive historical and generally highly critical debate in the development literature about the classification of countries as developed and less developed or developing. Without reviving that debate here, suffice to say that I use developing countries because it is still a popular term used to collectively describe nations that have relatively lower per capita incomes and are relatively less industrialized. This is consistent with the United Nations Developments Program’s (2006) categorization in its summary statistics on human development and is best represented by theWorld Bank’s classification of lower and middle income countries. It should be noted, however, that the UNDP’s classification of high, medium and low development countries produces a slightly different picture than the World Bank’s list of which countries are developed and developing. CSR is an equally contested concept (Moon, 2002b). However, for the purposes of this chapter, I use CSR in developing countries to represent ‘the formal and informal ways in which business makes a contribution to improving the governance, social, ethical, labour and environmental conditions of the developing countries in which they operate, while remaining sensitive to prevailing religious, historical and cultural contexts’ (Visser et al., 2007). developing countries present a distinctive set of CSR agenda challenges which are collectively quite different to those faced in the developed world. 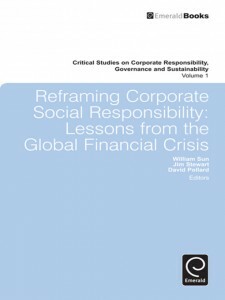 Visser, W. (2008) Corporate Social Responsibility in Developing Countries, In A. Crane, A. McWilliams, D. Matten, J. Moon & D. Siegel (eds. 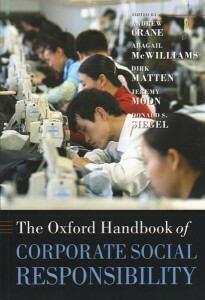 ), The Oxford Handbook of Corporate Social Responsibility, Oxford: Oxford University Press, 473-479.